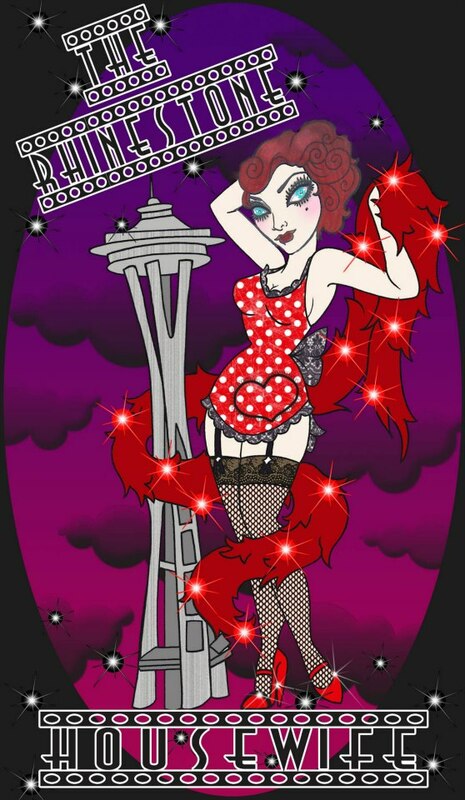 Here at The Rhinestone Housewife we are always on the look out for new vendors and products to add to the family. Well, I was lucky enough to stumble across Three Sisters Apothecary and instantly fell in love with the aesthetic of the products as well as the products themselves. The soap itself is beautiful and the packaging is beyond adorable. 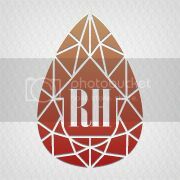 They offer a huge selection of products from lip shimmer to dog soap! 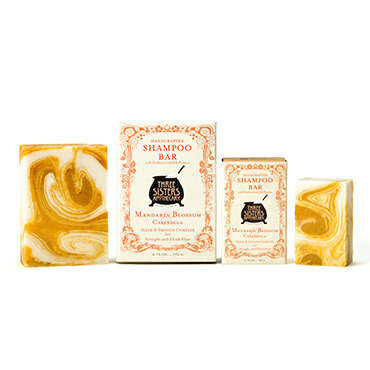 One of the products that I’ve been wanting to add to the shop is an option to traditional shampoo. I personally love shampoo bars and want to share some great options with people who might not have tried them yet. They are super convenient for traveling and just all around a great option. I stocked up on some smaller sized bars (not full size but bigger than sample size), let’s call them ‘petite’ size. I thought this might be an easy way to try out many different varieties! 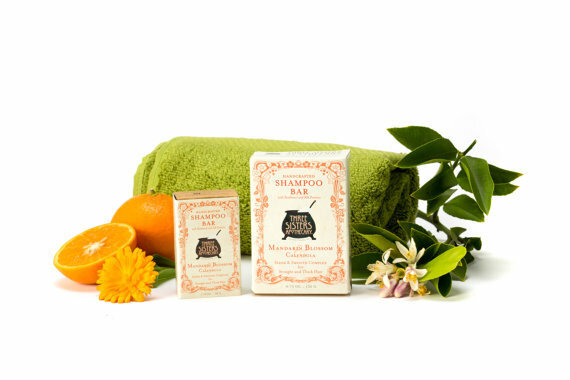 Mandarin Blossom and Calendula Shampoo Bar: Sleek & Smooth Complex for Straight Thick Hair – Nutrient rich with fluffy lather, the Sleek and Smooth Mandarin Blossom & Calendula Shampoo Bar imparts natural weight and shine making it ideal for straight and thick hair types. Key actives, natural botanicals, gourmet butters, oils and essential oils leave hair shiny and sleek without stripping away natural oils. 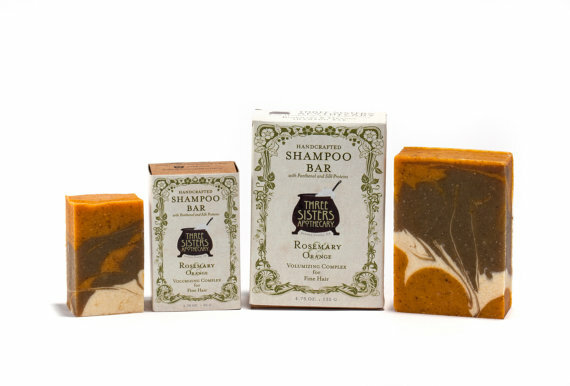 Rosemary & Orange Shampoo Bar: Volumizing Formula for Fine Hair – The Volumizing Rosemary and Orange Shampoo Bar, by Three Sisters Apothecary, gently clarifies adding volume and silkiness. Especially suited for thin and fine hair, the natural botanicals, gourmet butters, oils and essential oils leave hair radiant and bouncy. Super rich with loads of fluffy lather, the natural ingredients gently clean the hair and scalp without stripping away natural oils. 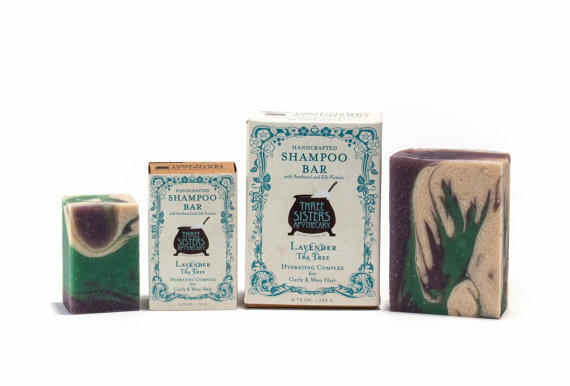 Lavender & Tea Tree Shampoo Bar: Hydration Formula for Curly/Wavy Hair – Super rich with fluffy lather, the ultra-moisturizing Lavender & Tea Tree Shampoo Bar by Three Sisters Apothecary, cleanses gently and imparts softness and shine. Ideal for Curly and Wavy hair, the key actives, gourmet butters, and oils leave hair shiny and healthy without stripping away natural oils. Just wondering if these are color safe? I would love to try them. Hi Donna! They are as color safe as any shampoo is. My trick with my red color is to only shampoo once to twice weekly and I’ve had great luck with these. I wouldn’t recommend the clarifying one for color treated hair, though. Any clarifying shampoo will definitely work to pull color out.